Not to get on anyone's case, but there are a few beauty blunders you could be making every day. Some of these no-nos are well-known, like pumping your mascara. But there are others that fly under the radar. Get the quick fixes to the flubs you didn't even know you were committing when you read on. 1. Blow Dryer: Holding the hair dryer closer to your strand or directly on the brush isn't getting your hair drier faster. It could actually be scorching your strands, causing damage and more frizz. Keep the heat at least one inch away from the hair - and keep the dryer in motion to avoid uneven heating. 2. Nail Polish: Although most products come with instructions to shake before use, nail polish isn't one of them. Avoid treating your lacquer like maracas, lest you want an air-bubble mani. Instead, roll the bottle in your hands to warm and mix the color. 3. Mascara: By pumping mascara, you're putting oxygen (and therefore bacteria) into the tube. And that very bacteria can eventually land in your eyes. Prevent trips to the doc by twisting and turning your mascara as you release it instead. And make sure to wipe any excess off the tip to stop clumps from occurring. 4. Flat Iron: First rule of flat iron club: if there is smoke coming up from your strands as you're ironing, your iron is probably set too high. Adjust the temperature to a medium 350 degrees, and always work in two-inch sections or less to get the best results. 5. Brush: Do you use your brush in the shower on wet hair? Are you using the bristles to rip through knots? Yes, the brush is a must-have tool, but it can also do harm if you're using it too harshly. 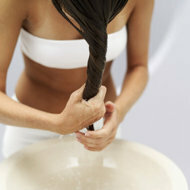 Use your fingers on wet hair for the most gentle detangling. And when you do work with a hair brush, begin at the ends and move upward to minimize snags. 6. Face Serums: If you want to get the full benefits of facial serums, be sure the sun doesn't counteract with their active ingredients. Make it a point to wear sunscreen on top of face serums during the day. Or better yet, slather your serum on at night. 7. Shampoo: The directions seem simple: wash, rinse, repeat. But you could be shampooing you hair all wrong. First, make sure your strands are fully saturated with water before you start (it could take a few minutes under the stream). Then, apply product primarily to the roots and scrub. Avoid piling hair on top of your head as this can cause tangles and dry out your ends. Let the product clean the ends as you rinse, and skip the repeat for a longer rinse. No one likes soap curd behind the ears, after all.